This section outlines some basic requirements to consider when deploying devices in an enterprise. It is a helpful starting point for IT admins who may not be as familiar with enterprise configurations and architecture. 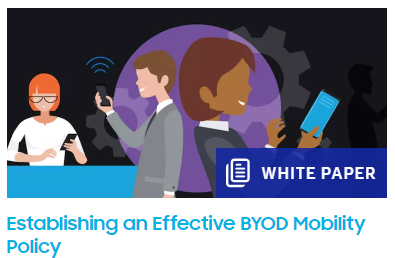 The first step in deploying Samsung Knox devices is to decide on both an MDM solution and an appropriate enterprise architecture. These selections are beyond the scope of this document. There are many approaches to how management infrastructure can be configured, from on premise servers to cloud to hybrid approaches combining the two. The specifics of this architecture should be discussed with your MDM solution vendor of choice. Regardless of your choice, the MDM needs to support the Samsung Knox features required for your business use-cases. The more complete the MDM vendor support, the more capabilities that can be controlled on the device as your business grows or changes. Here is a high level example of the deployment components in a typical enterprise environment. An MDM secures, monitors, manages and supports mobile devices deployed across the organization. 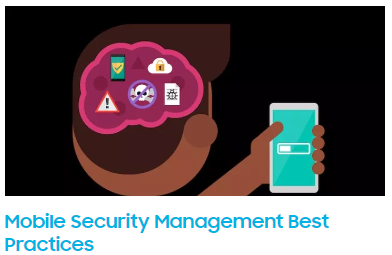 By controlling and protecting data and configuration settings for all mobile devices in the network, security risks are reduced. As part of the MDM, an app (usually called an Agent) is installed onto the mobile device. This Agent implements policies from the MDM and communicates back to the server, sending status information and logs for review. A secure VPN should be initialized between managed devices and the enterprise environment to prevent unauthorized access to enterprise resources. The connection should be based on certificates deployed on the user's devices. - Trusted users from logging into an unauthorized enterprise network. - The unauthorized login of untrusted devices into the enterprise environment. A directory service should be set up to store, organize and provide access to enterprise information. Business Applications Business applications allow enterprise users to fulfill or access certain business tasks pertinent to requirements. This may include management tools, accounting utilities and contact management software/solutions. - Facilitating secure communications through a VPN. - Granting access to the enterprise active directory. - Maintaining a secure connection to the company Wi-Fi. Certificates can be provided by a third party or created by the organization itself. Before you set up your devices in your environment, you need to define your business use cases. What are you deploying your devices for and what policies do you need to set? These questions are important to answer, as Knox Platform for Enterprise has many policies that you can apply, depending on your needs. Before you choose your policies, you typically need to decide how you want to configure your devices. These different configurations change the way Android and Knox handles the separation of personal and enterprise data. They also change the way policies interact with the device and effect the overall of level of management and control. In an Enterprise deployment, Google provides three modes of Android Enterprise, Work Profile, Managed Device and Fully Managed Device with Work Profile. Work Profile (Bring Your Own Device) - Users bring their own devices to work, and enterprise policies are applied to these devices. This typically gives users the most freedom, but may create a greater risk for the enterprise. 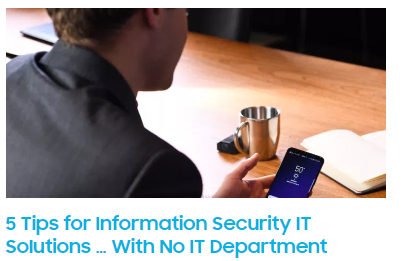 This configuration often has looser device management and support, but is balanced by limiting enterprise network access and enterprise applications. Managed Device (Corporate Owned) - Companies provide smartphones primarily for work use, but basic functions such as voice calls, messaging and personal applications are allowed, with some controls on usage and flexibility. This gives an enterprise more control over applications, integration and security. Typically, the device user is allowed to use the device for non-enterprise functions as well. Fully Managed Device with Work Profile (Dedicated Device) - This use case prohibits personal use of a mobile device. 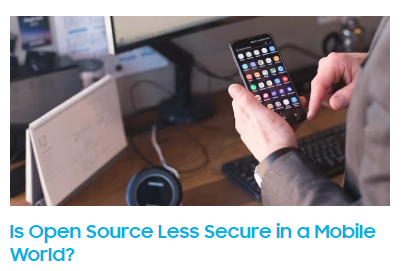 A dedicated device is often used to describe a device running only a single application, such as an inventory system with an embedded barcode scanner, or it could just be a smartphone where policies prohibit personal use. You can read more about these implementations and how they relate to Knox on the About Workspace page. Choosing the correct MDM policies is crucial to ensure your security requirements are covered adequately. For example, this image below shows an MDM console and the policy that controls if users can install apps from untrusted source. Disabling this feature ensures that only apps approved by the IT admin can be installed. This helps prevent accidental installation of malicious content. Here is another example. This table lists some policies an IT admin can apply to prevent data leakage. Data protection - Provide functionality to protect data at rest and data in transit. Require On Device Encryption (ODE) - Encrypt data on the device using AES 256. SMS / MMS and RCS capture - All messages sent or received are recorded for audit. Require VPN - Use a VPN anytime work data is accessed or transmitted on the device. App Management - Provide functionality to manage device apps. Application resource restrictions - All work apps run inside the Knox Workspace. Disable Google Play - Any personal app needs IT approval before it can be installed. Access Control - Implement access control to reduce user permissions and assist in reducing unauthorized access. Device lock - Device locks automatically after a defined period of inactivity (1 to 60 minutes) limiting access to device functions accept those that are explicitly authorized such as emergency calls. Credential complexity - Forces users to set a complex password. For example, a 6 digit PIN. Hotspot Control - Devices cannot be configured to use hotspot sharing. Network monitoring - Control and audit mobile endpoint configurations. Enable logs and auditing - Monitor and generate records related to security-relevant events within the device. Disaster recovery - Protect data in event of lost or stolen device. Remote wipe - Track devices from the MDM and remotely wipe all local storage and the SD card. If two similar policies are applied to a device, which one takes precedence? 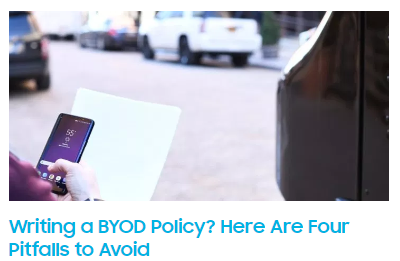 If a device is managed by two MDM's or if it is managed by an MDM and also by EAS policies, the stricter policy takes precedence. Provisioning devices is the last step in the enterprise deployment journey. This is when you apply all of the security principals listed above and then physically give the device to the user. This list outlines the most common steps taken when provisioning a device for the first time. Enroll the device with the MDM agent. Install applications required for enterprise productivity. Enabling Always-On VPN is recommended. Configure the email client to connect to the enterprise server. 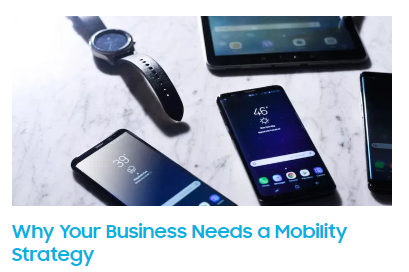 These Samsung Insights posts provide more information on mobile enterprise strategies.